Talbot J. Wieczorek, one of the managing partners of Gunderson, Palmer, Nelson & Ashmore, LLP, has been with the firm since 1991. 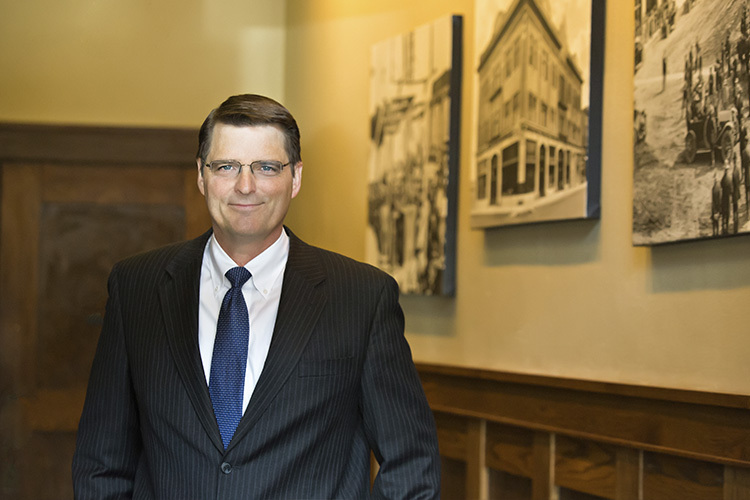 He specializes in representing individuals and businesses in Complex Litigation and Business Issues. In addition, he acts as general counsel to a number of small government entities and nonprofit groups. Such entities include: the City of Piedmont, Bear Butte Valley Water, Inc., Southern Black Hills Water Systems, Inc. and Colonial Pines Sanitary District. Talbot's practice also includes representing business clients and individuals regarding securities issues and representing telecommunications companies and other industries before the South Dakota Public Utilities Commission. Talbot earned his B.S. from South Dakota State University in Commercial Economics with a minor in Mathematics. He received his law degree with honors from the University of South Dakota. Prior to law school, Talbot worked in the South Dakota Governor's Office and ran a bond referendum campaign in Sioux Falls. Talbot is a member of State Bar of South Dakota. He is also an active member and past President of the Pennington County Republican Ambassadors. Talbot has been elected as a Delegate for the South Dakota State Republican Convention in several election cycles and acted as the Convention parliamentarian three times. He is an AV Preeminent Peer Review rated attorney by Martindale Hubbell, and was recently selected by his peers for inclusion in the 20th Edition of The Best Lawyers in America in Administrative/Regulatory Law, Commercial Litigation and Corporate Law. Talbot is currently on the Black Hills Symphony Board of Directors, the Rapid City Area Chamber of Commerce Board of Directors, the Rapid City Parking Advisory Committee, and the Meade County Planning Board. Talbot is also the Meade County Public Commissioner Elect; he will be formally seated in January of 2019. Recognized by The Best Lawyers in America for his work in Administrative / Regulatory Law, Commercial Litigation, and Corporate Law.